Oscar winner Halle Berry's new CBS television show is set to air this summer. In 2002, Berry became the first African American woman to win an Academy Award in a leading role for her performance in Monster's Ball. Now she is starring in a new TV series, a science fiction thriller called Extant. Extant was created by film writer and producer Mickey Fixher (The King of Iron Town (2004), Summer Nuts (2006). It is Fisher's first venture into the world of television. Acclaimed film director, screen writer and producer Steven Spielberg is the executive producer of Extant, along with Halle Berry herself. Berry plays the lead role of astronaut Molly Woods. When Molly returns home after a 13-month solo space mission, she is shocked to discover that she is pregnant. She has no recollection of what happened to her and no explanation. Molly must readjust to life o Earth after over a year of isolation in a space station. She must resume a normal family life with her scientist husband, John Woods (played by Croation actor Goran Visnjic), and their son, Ethan (played by Pierce Gagnon). However, their family life was never normal, even before Molly's space flight and her mysterious pregnancy. Ethan, is not Molly and John's biological son since Molly is supposedly infertile. The boy is actually a human robot, designed by his father. He is the first of a future line of "humamichs." Herein lies the great unanswered question. Is Molly's unborn child some kind of "Rosemary's Baby" or part of new phase in human evolution? Stay tuned. Extant is scheduled to premiere on CBS on Wednesday, July 9, 2014. 13 episodes of the series have been ordered. By the way, the show's tagline ("extinct/extant) plays on the meaning of the word extant (which means "living" or "existing" as opposed to extinct). Halle Berry was born in Cleveland, Ohio on August 14, 1966. Her first television role was in the series Living Dolls, a spin-off of Who's the Boss?. Only 12 episodes of the short-lived 1989 comedy were produced. The show starred Michael Learned of The Waltons and featured Halle as Emily Franklin, one of four beautiful teen models being mentored by Learned's character, Trish Collins. Trish's sister, Marion was portrayed by Marion Ross of Happy Days fame in two episodes of the series. The other three aspiring models were Leah Remini as Charlene "Charlie" Briscoe, Alison Elliott as Martha Lambert and Deborah Tucker as Caroline Weldon. Charlie was a friend of Samantha Micelli, Tony Micelli's (Tony Danza) daughter on Who's the Boss?. Trish Collins, a sort of den mother to the quartet of models, was an associate of Samantha's grandmother, Mona Robinson (Kathleen Helmond). Described as a "lightweight" comedy by The Compete Directory to Prime Time Network TV Shows: 1946 - Present, Living Dolls was savaged by critics. Unlike the long-running, Emmy-winning Who's the Boss?, it was cancelled after just two months. 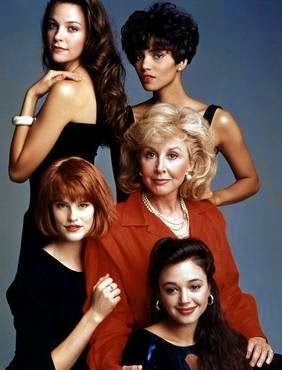 Below is a photo of the cast of Living Dolls with Halle Berry in the upper right corner above Michael Learned. Leah Remini, who went on to star as Carrie Heffernan in the hit sitcom The King of Queens (1998-2007), is at the front and Deborah Tucker is at the left of Michael Learned. Alison Elliott is at the top left. In 1991, Halle appeared in an episode of the comedy Amen, starring the late Sherman Hemsley of The Jeffersons as Deacon Ernest Frye of the First Community Church of Philadelphia. She played the role of Claire in an episode entitled "Unforgettable" (Season 5, Episode 10, Air Date: January 1991). That same year, Halle appeared on another comedy, A Different World, as Jaclyn in an episode called "Love, Hillman Style" (Season 4, Episode 15, Air Date: February 14, 1991). She also played Rene in an episode of the science-fiction comedy about two teen aliens, They Came From Outer Space ("Hair Today, Gone Tomorrow", Season 1, Episode 16. Air Date: February 19, 1991). In addition to those 1991 TV appearances, Halle Berry had a recurring role in six episodes of the prime time soap Knot's Landing as Debbie Porter. Berry played the lead role in Alex Haley's Queen, a three-part 1993 mini -series on CBS. Queen tells the story of the son of a Southern plantation owner who falls in love with a slave named Easter. They have a daughter, Queen, who faces the challenges of fitting into post-Civil War society in America. The series is a television adaptation of the novel Queen: The Story of an American Family, about the life of Queen Jackson, Alex Haley's paternal grandmother. It aired on CBS for three nights on February 14, 16, and 18, 1993. Halle Berry starred in a 1995 television movie called Solomon and Sheba. She portrayed Nikhaule/Queen Sheba in this biblical drama surrounding the love affair between King Solomon and the Queen of Sheba. Jimmy Smits, of L.A. Law fame, played Solomon. Solomon and Sheba originally aired on February 26, 1995. In 1998, the actress starred in another television movie, a drama/ romance entitled The Wedding. The Wedding, based on a 1995 novel by Dorothy West, aired in two parts on ABC on February 22 and 23, 1998. Halle Berry portrayed Shelby Coles, the protagonist in this story of relationships and racial prejudice set in the 1950s in Martha's Vineyard, Massachusetts. Halle had a voice role in a 1998 episode of the hit sitcom Frazier, starring Kelsey Grammer. She provided the voice for a character named Betsy in an episode entitled "Room Service" (Season 5, Episode 15, Air Date: March 3, 1998). The next year, she attracted a great deal of attention for her performance as singer/actress Dorothy Dandridge in the award-winning HBO television biography that aired on August 21, 1999. For her role in Introducing Dorothy Dandridge, Berry won a Prime Time Emmy for Outstanding Lead Actress in a Miniseries or a Movie. She also won a Golden Globe for Best Performance by an Actress in a Mini-Series Or Motion Picture Made for TV. It's interesting to note that Dorothy Dandridge was the first black actress to be nominated for an Academy Award for Best Actress in a Leading Role. Dandridge received an Oscar nomination for her role the 1954 film Carmen Jones but lost out to Grace Kelly in The Country Girl. How fitting that Halle Berry, the actress who portrayed Dorothy, should finally win it in 2002 when she received her Oscar for Monster's Ball. Halle Berry's last television role prior to Extant was in the 2005 TV movie called Their Eyes Were Watching God. She starred as Janie Crawford in this drama/romance set in a small Florida town in the 1920s and based on a 1937 novel by African-American writer Zora Neale Hurston. Two of the movie's co-producers were Oprah Winfrey and Quincy Jones. It originally aired on the ABC network on March 6, 2005. Halle Berry in a scene from Their Eyes . . .
British viewers will be interested to know that Amazon has acquired the exclusive UK rights to Extant. Amazon will stream the sci-fi thriller on its Prime Instant Video Service in the United Kingdom one day after broadcast in the United States. EDITOR'S UPDATE (March 18, 2015): On October 9, 2014, CBS announced that Extant will return for a second season, which is scheduled to premiere on July 1, 2015. There will be some cast changes, though. Goran Visnjic, who plays Molly Woods' robotics engineer husband, John Woods, will only be returning for a couple of episodes at the start of the new season. Camryn Manheim, who portrays Molly's friend and co-worker, Sam Barton, will also appear in just a couple of episodes. Hiroyuki Sanada (Hideki Yasumoto) and Michael O'Neill (Alan Sparks) will not be coming back at all. Meanwhile, Jeffrey Dean Morgan will join the cast in the role of J.B. Richter, a mysterious stranger. EDITOR'S UPDATE (September 11, 2016): On October 9, 2015, CBS cancelled Extant after two seasons. However, the network is developing a new legal drama for which Halle Berry is executive producer. The new series, titled Legalese, stars Berry as a biracial lawyer from Chicago who follows a case to New Orleans.and teams up with a "good ol' boy" white attorney.